I've posted before about my second bedroom which is now known as......The Broadway Suite. It's a name coined by friends of mine who've stayed over when they visited. 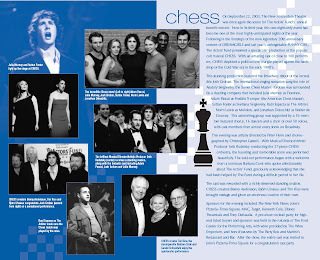 Anyway, today there is a new addition to the walls.........a CHESS poster from the 2003 Actors' Fund Concert! Oh, the other poster is from A Streetcar Named Desire with Natasha Richardson. Check it out! Lani, have you framed yours?